We make sure that your brand looks great everywhere. Never before have there been so many opportunities for your business or organization to look awesome in a variety of ways. 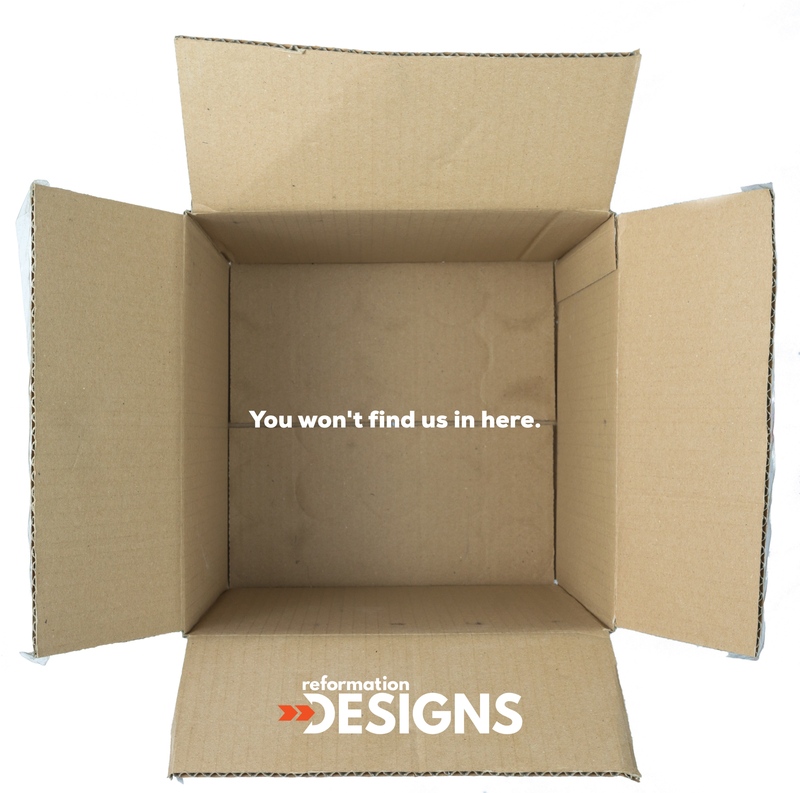 At Reformation Designs, our team makes sure that your branding is consistent across all of your digital and print elements, apparel, social media, and more. 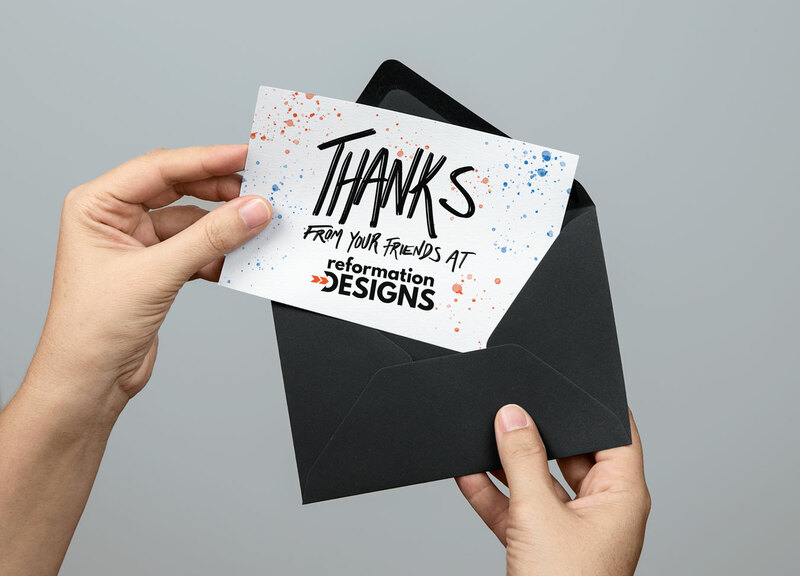 At Reformation Designs, we believe that the creative process is easier to navigate when you have trusted advisers, mentors, and coaches who understand the big picture of your project or idea. We specialize in bringing creative direction and clarity to the table and love helping people just like you bring your ideas to life. In our creative consultations and coaching sessions, you will be given valuable perspective on how to tackle the creative challenges you are facing, recommended action steps and reading materials, as well as real-time feedback on how to see your ideas through to completion. Creating an iconic and distinct brand identity is all about leaning into what makes you and your idea or organization unique and stand out from the crowd. It goes beyond just having a nice logo to put on some business cards…this is about how we capture the essence of who you are and let that come to life with all the visual elements of your organization or project. And now, with our signature CoCreate sessions, you get to watch your brand come to life right before your eyes. Check out some of our recent branding work and learn more by clicking below. Whether you need custom apparel for a big event or new product launch, business cards to show your expertise at networking gigs, flyers to help spread the word about something that you’re doing, or some thank you cards to your biggest fans, we’ve got you covered. If you’re looking to really stand out from the crowd, you’ve come to the right place. 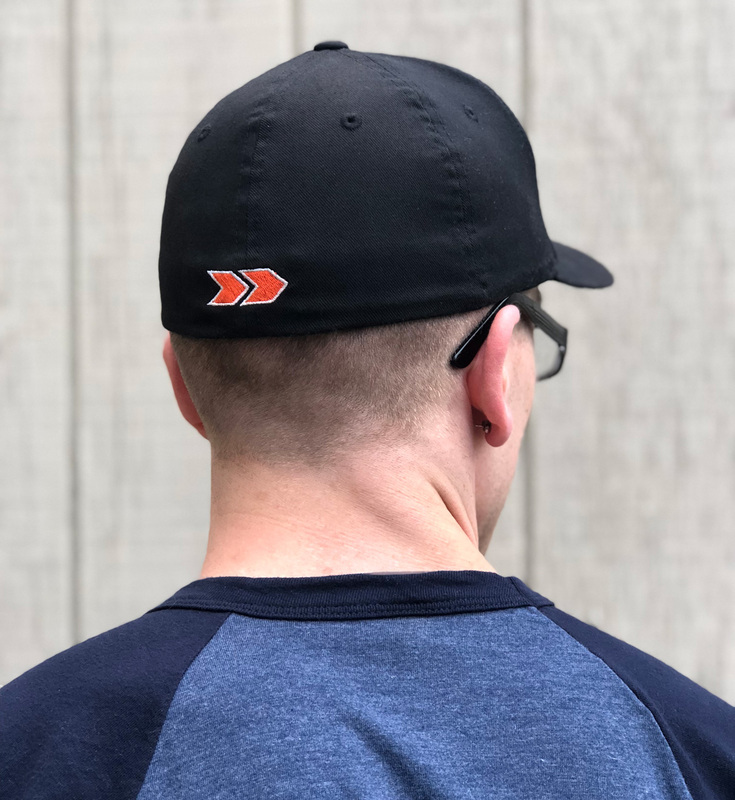 We can outfit you and your team in all the custom swag you can handle. There are an infinite number of ways to get the word out about what you are creating these days, and customized multimedia is one of the best ways to do so. When it comes to building your brand, whether you need graphics, video production, custom products or print design, Reformation Designs is the solution you’re looking for. When you’re launching your own creative projects, you’re constantly faced with tons of decisions that you have to make. Thankfully, with the magic of technology available today, you can build systems that are tailored to your specific needs so that you can focus on doing what you’re good at instead of micro-managing your business. Our team will work with you to learn what kinds of problems you’re having and come up with innovative automation solutions to automate the more tedious aspects of running your business. We are well versed in software like Zapier, Trello, Book Like a Boss, & IFTTT and can create productivity enhancing & customized systems built just for you. At Reformation Designs, we believe good design should MAKE you money. Your online & offline presence should make it easy for your customers and fans to interact with and support your business or organization. We will craft custom branding and design solutions for you and your team that are focused on the results and goals you are seeking to achieve. Think of your your logo like it is the visual foundation of your brand. It is a reflection of your mission, your values, how you communicate with your customers, and the message you want to share. Our team specializes in building and designing customer-focused brands in a way that makes sure you stand out from the crowd and look great, too. Your website is your real estate on the web. If your site isn’t mobile-friendly, regularly updated, professionally designed, and easy to navigate, you’re leaving money on the table. With over 20 years of web design and development experience, we make sure that your online home looks and functions the way it’s supposed to on all devices. We bring over two decades of creative industry experience to the table. When you choose Reformation Designs to help you bring your creative projects to life, you are working with a team that has extensive experience in the creative arts. If you are building your own business, starting your own project, or creating anything from scratch, you know that there are a ton of decisions to make. We help take the guesswork out of the beginning stages of designing your brand. Branding isn’t just about your logo - it’s about the experience that you create for your customers. We will work with you to create an experience that is uniquely yours, tells your story in a visually captivating way, and helps you engage and connect better with your audience. 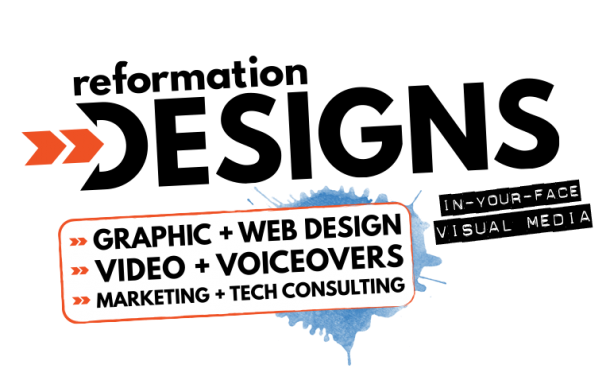 Contact Our Creative Pros TODAY! Just a quick note: You will NOT be charged until after our team reviews your project request. The first step to getting started is setting up some time for us to connect. Final price is dependent on a variety of factors including things like deadlines, audience size, special circumstances, etc. Details of each project will be outlined in full prior to time of service and contracts signed for approval. Payment plans and financing options are available upon request. 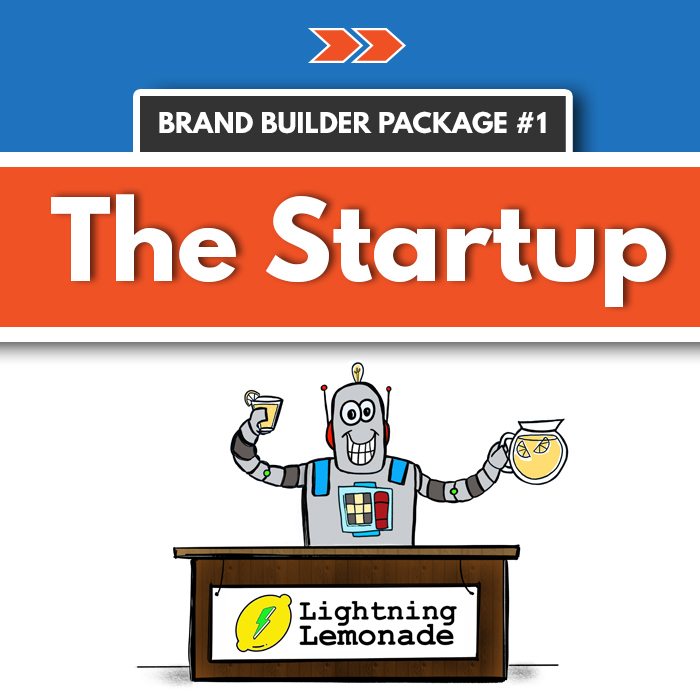 I want the startup package! 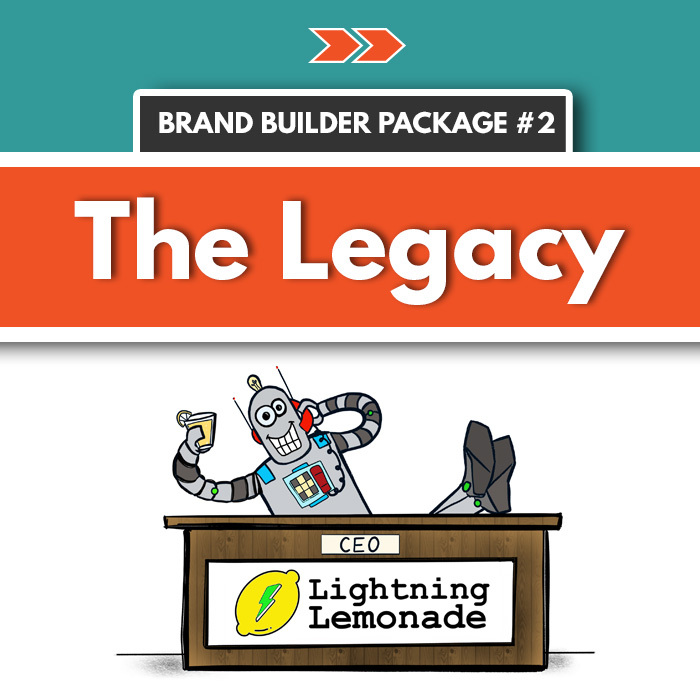 The Legacy package is for me! Let's go with the enterprise! This is by far one of our favorite parts of the creative process. Once we have created your brand / project concepts, our team will connect with you via the magic of the internet and live-screen sharing technology. This is a MUCH more efficient way to handle revision requests. We’ll finalize your brand identity right before your eyes to ensure that you get the design that you are looking for and also lets you see a bit of the behind-the-scenes of what goes into building your brand. This process saves our clients time, money, and is always a great experience to see unfold. This is our comprehensive brand audit and creative consultation to help you think about the big picture and form a long term vision about your brand’s continued success. We will go over your goals, come up with branding strategy, and figure out the best options for moving forward. Our exclusive brand builder web application helps nail down the specifics of your personal style. When it comes to branding, the more we know about the personality of your business, the better we can help create branding elements that truly capture the essence of your brand. We’ll design several professional logo concepts for you to choose from, and after you pick the design you like best, we’ll finalize the logo together via our signature CoCreate Session where you’ll get to see your logo come to life. 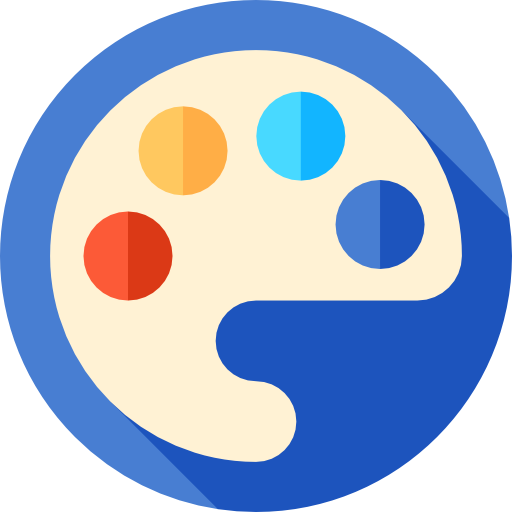 Through the magic of the internet, you’ll get to watch your logo come alive and provide input in real time! Together we will give your logo the perfect personal touch, while also eliminating the need for numerous revisions and saving you time. This is your personalized branding style guide which details the fonts used, specific color palette with HEX codes, and versions of the logo to use on dark and light colored backgrounds. It comes as a high-quality printable PDF. We’ll provide you with branded graphics with your shiny new logo formatted perfectly for Facebook, Twitter, Google+ & YouTube (or 4 networks of your choosing). We’ll craft a custom signature graphic with your new logo for use with email, internet forums, or other internet communication. You’ll receive high-resolution graphics & vector artwork for further branding efforts. The files are print-ready and are provided in formats accepted by most print companies. In addition, you’ll get web versions of the logo for use on social media, your website, or elsewhere on the web. You’ll get a video intro/outro (up to 15 seconds) showing off your logo and branding. It’s designed for use at the beginning and end of videos that you share on your website or elsewhere on the web. Voiceover available if desired. We’ll provide you a custom letterhead design with your new logo and branding so you can keep a consistent look and feel when communicating with clients. 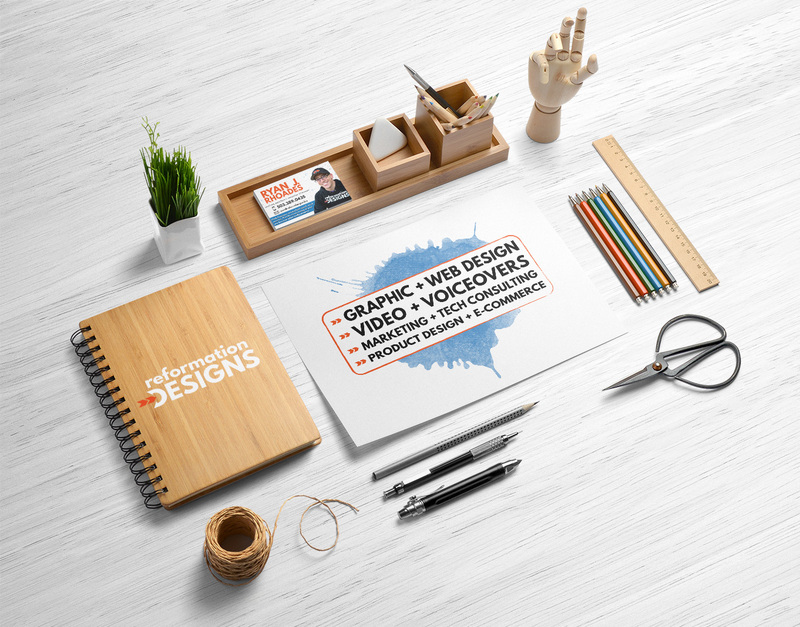 Using the colors and style of your new branding, we’ll create a custom marketing flyer design. Standard size is 8.5” x 11”, but we can customize it to suit your needs. With every branding package we offer, we send you a copy of our first book, Stop Wasting Time & Burning Money: How to Crush Procrastination & Live the Life of Your Dreams! Using your new logo and branding, we’ll create a custom banner for your website. If you don’t have a website, we can talk with you about that as well. Just ask and we’ll figure that out. Take a sip from that sweet, sweet taste of victory when you are drinking your morning coffee or tea from a mug with your very own logo and favorite quote on it. Congratulations! 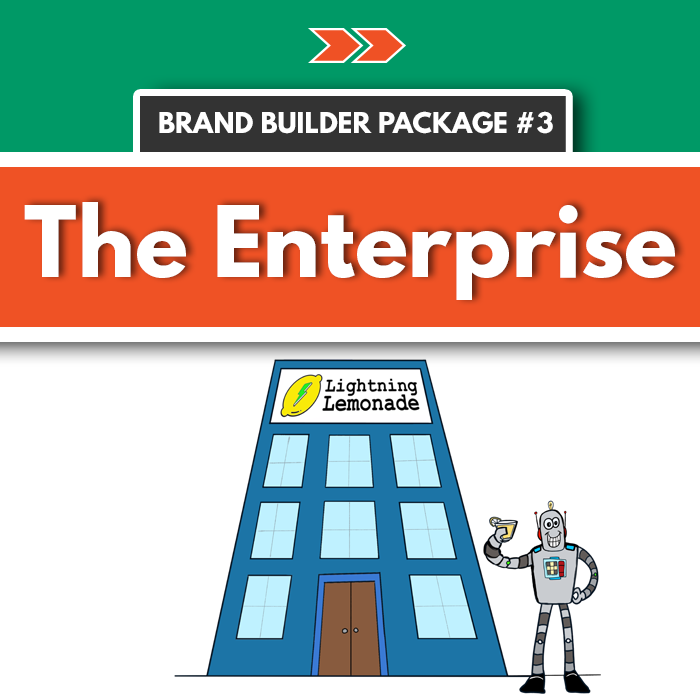 Want to rock your brand out in public? Now you can with your very own custom tee from Reformation Designs. Multiple sizes, styles, and colors are available and they feel great, too. Choose a branding Package today! Ryan & Laura at Reformation Designs are two of the most driven, inspired, & creative people that I have come across. Their keen eye for sharp design and strong desire to always learn and better their craft makes them a couple that I would recommend in a heartbeat. Check them out - you won’t be disappointed. Ryan and Laura are a power team! They have a rare talent that allows them to take a complex idea and express it artistically in a simple way so that the average person can understand it in the blink of an eye. When you work with them, you can rest assured that your business and best interests are in good hands! I recommend Reformation Designs for anyone that wants to increase brand awareness. 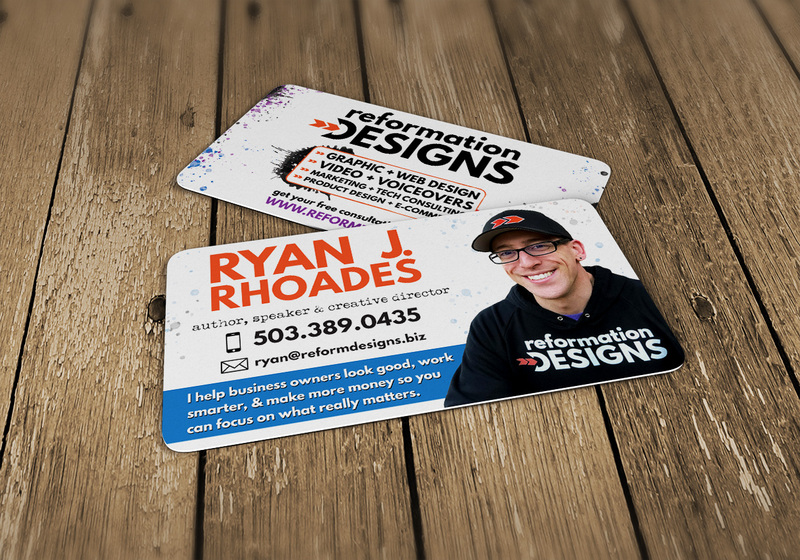 Ryan and Laura of Reformations Designs were the right choice to help revamp my tired, outdated logo. They took the time to understand me, my vision for my brand and what I wanted it to accomplish. They brought great ideas and insights to me. 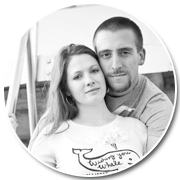 Ryan and Laura became part of my entrepreneurial team and I highly recommend working with them. There are an overwhelming number of ways to build a genuine audience and customer base. Working with Reformation Designs has consistently helped me discard the noise and distill down the truly helpful information that’s unique to my platform. Their ability to see the individual and business model from a 360 degree view, and guide them on the path of least resistance is at the same time exciting, and comforting. They take out the confusion and distraction, leaving you with clear and achievable steps. Brilliant. Superheroes Ryan & Laura of Reformation Designs are awesome! They will engage & inspire your audience with their creative superpowers. Your graphics are among the top shared posts on our Facebook page & are really getting Jack Canfield’s name out there. The images were beautiful! We were spending a bunch of time putting together our own graphics in Photoshop but they didn’t even compare to the work you did. From the get-go, they were getting us thousands of likes & shares on social media. We will definitely use your services next time we need more of these beautiful graphics. Ryan has strong interpersonal and leadership skills, knows how to cast a vision and follow through and implement great designs per the client’s request. Strong technical design skills and very customer service oriented. Ryan was the type of professional we all long for. High quality work, prompt in his response (phone calls no less), and nothing but a pleasure to work with. I’ve almost lost all the hair on my head sending copious notes of errors to developers who were supposed to be fixing things. Reformation Designs produces first rate work AND is reliable - a combination which is SOOO hard to find. Creativity & making ideas happen is what we do. We are here to help you look good, work smarter, and make more money so that you can focus on what really matters. Our team bridges the gap between concept and reality and we are here to help bring your ideas to life. So let's get this party started - click below to reach out!